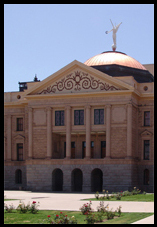 The bill was filed today to transfer the duties of AZGS to the University of Arizona. Senate Bill B1530 includes a number of other agency consolidations. AZGS statutes stay largely the same, except for an opening statement that the agency is established within the University of Arizona, and the duties to support the Oil & Gas Conservation Commission are transferred to the Dept. of Environmental Quality. There are a few technical corrections to update statutory language, but otherwise all duties are transferred to the university to carry out. Surprisingly, the bill retains the requirement that the Governor will appoint the State Geologist/Survey Director, who serves at the Governor's pleasure. I am not aware of any other position in the university that is appointed by the Governor. The swarm began on March 28 and more than 50 earthquakes have been recorded so far. Swarms in other areas have lasted for months in some cases.